As with all areas of technology, the headtorch is improving every year, both in terms of brightness and battery life. You don’t have to go too far back in time to find a choice of one – the Petzl Zoom – with its weak and blow-able incandescent bulb, or the chunky 4.5V battery that seemed to die in a couple of hours. The introduction of LEDs completely revolutionised the world of hands-free lighting, they are now more efficient and long-lasting, and the choice is simply dazzling. So, what should you be looking for when you buy a new headtorch? The S.I. (Standard International) unit of light intensity is the lumen, a measurement of the total amount of visible light emitted from the LED source. In practical terms, 10 lumens is fine for close up jobs, pitching a tent, reading a map, 60 lumens for walking, as long as you don't need too much navigating, 100 lumens is the minimum I’d like to run off-road with, and 500 lumens may as well be daylight. The brighter the better, but a dimming switch is also important. For close up ‘proximity’ lighting, a wide beam is best for a good spread of light. When looking for that cairn in the distance, you’re going to need a concentrated spot to focus on. For running you’ll want a combination of the two so you can see your feet and the trail ahead. Most headtorches will have some way of varying the beam, either with separate LEDs or a diffuser. The brighter the light the faster the battery will drain. Many headtorches will take standard AA or AAA alkaline batteries, great for occasional use, meaning you can easily carry and acquire spares. It's worth investing in a headtorch with a rechargeable Lithium-Ion battery if you're going to be out at night regularly. Initially more expensive, they will pay for themselves very quickly. USB recharge is standard, top up just about anywhere, in the car, at home or by solar panel. A torch with a regulator will maintain a constant output for almost the entire life of the battery, before suddenly dropping to a very dim emergency light at the end. The alternative is a steady reduction in brightness as the power drains from the battery. Battery pack on the front or back? A battery positioned at the rear makes the whole unit feel more balanced and bounces less (important when running), you can use a much larger (longer lasting) battery than if the headtorch is contained all in one unit. However, headtorches with the battery at the front will be smaller and lighter. When it's dark, wet and miserable outside, and you're struggling to navigate back to safety, the last thing you need is lighting failure. Fortunately, all the headtorches we sell are weatherproof to some degree, at least to IPX4 standard (withstands splashing water from any angle). We've used IPX4 rated headtorches in some serious wet and stormy conditions without any problems. Headtorches rated IPX6 (able to withstand a powerful jet of water) or IPX8 (retrieve intact from the bottom of the pool) like the Black Diamond Spot and Ion will provide complete peace of mind. 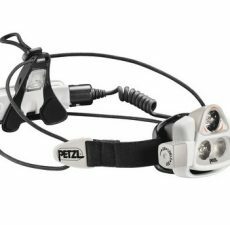 This clever device is currently available on some Petzl headtorches and will automatically adjust the beam according to what is in front of you. The light dims to the minimum setting with a very wide spread when looking at a map. Look up into the distance and the light adjusts in a fraction of a second to a powerful, focused beam. No need to jab at buttons, and the battery life is greatly enhanced, as the full beam is not needed as often. It's not entirely foolproof - heavy snowfall tends to confuse it - but when that happens you can manually override the sensor. Our top two headtorches are the Petzl Nao+ and the Silva Trail Speed Elite. they are bright and ideal for fast moving fell- and trail-running or for keeping on the move throughout the night. These torches have multiple brightness settings, are more weather resistant and last longer. They also feature a beam pattern that allow you to see far enough ahead to navigate, while still giving enough of a spread to see your feet and immediate surroundings. For runners, having the battery pack mounted on the back of the head will keep the weight balanced and minimise bouncing, it's also worth investing in some Hi-Viz accessories to increase your chances of being seen. Want a headtorch to do everything, without spending a fortune on it? the current Outside Staff Favourite has to be the Petzl Reactik+ and its baby brother the Reactik. Both employ the same Reactive Lighting Technology as the larger Petzl Nao but in a more compact, lightweight package. They're impressively bright, and have a much longer battery life than the Nao. The rechargeable Li-Ion batteries will save you a lot of money over the life of the headtorch too. The other current favourite is the Black Diamond Spot. This tiny little thing is inexpensive, weighs 90g with the batteries and is completely waterproof! At 200 Lumens max output, it's seriously bright, although the output is un-regulated so that will drop pretty quickly. It's powered by 3 AAA batteries, so you'll have to factor in the cost of replacement batteries, but then again that may be useful on extended trips without access to a re-charge socket. The Petzl eLite and Black Diamond Ion are two tiny little headlamps that you can stash away 'just in case'. They're great in an emergency (if your main headtorch runs out of juice), providing just enough light to walk or climb with, or for use around the campsite (so you can save the battery on your proper headtorch). Top Tip - Climbers, buy a chalkbag with a little zipped pocket on it and keep one of these in there. You'll be really glad you did one day! A Petzl eLite on the summit of Half Dome - enough light to get down with, but only just!